So following on from the saga of the broadband checker losing me, I've received a letter from BT flogging me Infinity. a) Checking on the infinity website, the checker says that FTTC will not be rolled out in the next six months. Every website you visit can see your IP Address at the time. So the Infinity checker sees it. All IP addresses identify the underlying ISP. Given your postcode we can check more accurately the FTTC schedule for it, as the Infinity checker is specifically for that product, and subject to Marketing control, not Openreach FTTC in general. As an alternative to, or as well as, posting your postcode, this checker using your phone number is the next best thing. b) The letter says I have to switch away from current provider. He's not on an LLU product (unless I'm not up to date with the AAISP range) so that's a downright lie, and worthy of a letter to Ofcom imho. If the user put in their number to the Infinity checker, surely they can match this to their own records and see if the number is with them already and state he needs to switch to get the service? Why? "Infinity" is BT Retail's product. So what they have stated is correct. But as Bob said- they can check his IP to find out who he is with already, and it's AAISP. 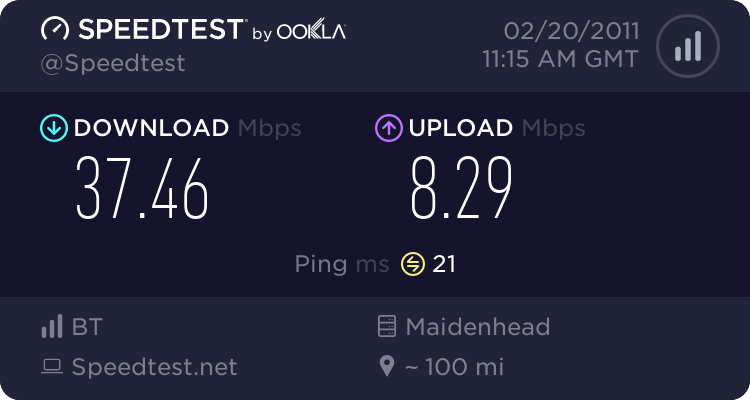 You don't need to switch away from AAISP to get FTTC, and although it would be necessary to switch to get Infinity, the difference is so slight that it's definitely misleading marketing. This argument has been had before though. BT are stating that the user needs to move to them, to get Infinity. That is correct. I doubt the letter states that they're only the ones that can provide a fibre services. At the end of the day, it is about who has the most money. If any other ISP wanted to put similar ads on the TV, or do massive mail drops about their own product, the end result would be the same. The morality of it basically confirms my opinion of BT Retail. Which part of "I've received a letter from BT flogging me Infinity" gives you the impression that AAISP are selling Infinity or any other ISP other than BT Retail are selling a product called Infinity or that the OP would not have to move to BT to get BT Infinity. Because of their near-monopoly position, Radio Times are required to state that "Other listing magazines are available". Why should BT be able to take advantage of its complete monopoly of the FTTC market to squeeze out other suppliers?